Enerpac have introduced a new system of plastic cribbing blocks and wedges to optimise safety when stabilising heavy loads after they have been lifted. The blocks developed as a more stable, longer-lasting and easily cleaned alternative to wooden blocks feature a patterned slip-resistant pyramid locking surface for superior stability in cribbing, chocking and shoring. The plastic cribbing system applied in energy, mining, maintenance, construction and infrastructure tasks complement Enerpac’s broader ranges of powerful but compact lifting and load handling technologies. The Enerpac range includes heavy duty load skates, low clearance machine lifts and vertical lifting wedges requiring only 10mm tip clearance to apply 700 bar hydraulic force. Enerpac cribbing system would not splinter or does not absorb most fluids and thus can be used for interlocking box cribs, parallel cribs and triangle cribs. 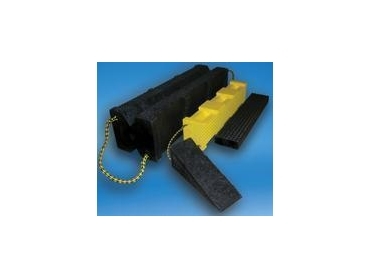 The plastic cribbing system is available in three sizes of cribbing blocks and two sizes of wedges, the system, made from recycled plastic, and is available in different combinations of wedges and blocks in nylon carrying totes.